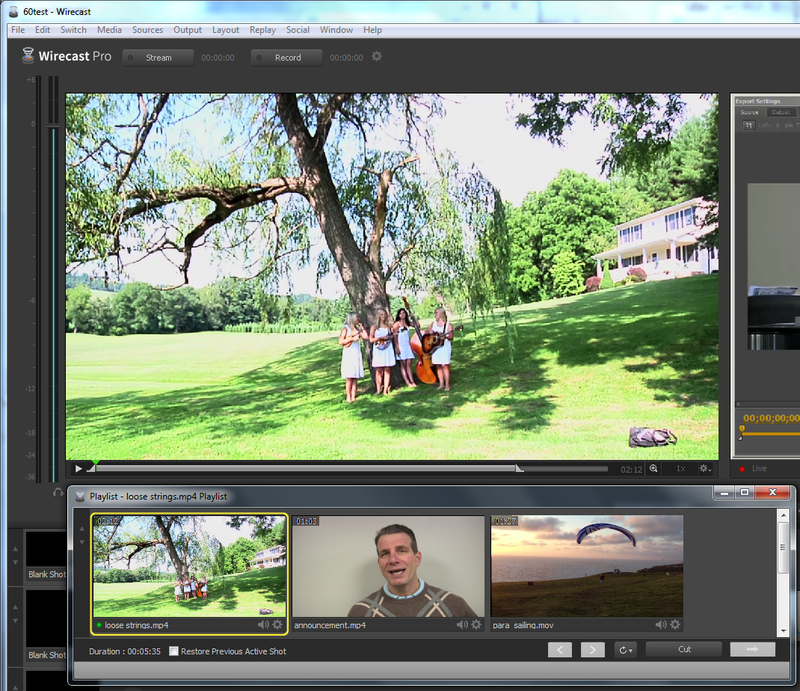 Telestream Wirecast is a premier live production software program that we’ve reviewed many times, and watched its evolution closely over the last several years. With version 5, Telestream simplified the interface, making operation more intuitive, and added x264 output, improving production quality. With version 6, Telestream has converted the program to 64-bit operation, which should enhance performance and stability. Telestream also added several key features, including playlists, social media support, input from iOS devices, and instant replay. Like previous versions, Wirecast 6 has two editions, Wirecast Studio ($495 retail) and Wirecast Pro ($995 retail), and not all new features are included in both editions. As I discuss the program’s new capabilities in this review, I’ll indicate which features are available only in the Pro version. Note that Telestream is offering special upgrade pricing, so it will cost only $149 to upgrade from Wirecast Studio 5 to Wirecast Studio 6, and $295 from Wirecast 5 Pro to Wirecast 6 Pro. Check previous reviews (Wirecast 1.0; Wirecast 5) and tutorials (Wirecast 5) for an overview of program operation. In this review, I’ll describe how the new features work and how they might fit into your productions. Let’s start with playlists. Playlists are groups of content that you can queue and play back at any point in a Wirecast production. They’re great for creating sequences for beginning and ending your productions, and for filling breaks between acts, sets, halves, or innings. Thus they’re useful for almost any production. Within Wirecast, a Playlist can contain pre-recorded VOD files or live cameras, so you could use a playlist to cycle through various cameras in your production, or to intersperse live material with VOD content. You can create a playlist using the New Document function in the four-up display in the timeline, or by dragging and dropping one piece of content over another. One of the nicest additions to the Wirecast interface is a trimming function in the Preview window which you can use to cut the heads and tails from your VOD clips. If you want to trim your VOD content for playback in the playlist, it’s easiest if you trim before dragging the clip into the Playlist window (Figure 1, below). Otherwise, you’ll have to move the clip to the front of the playlist to make it appear in the Preview window, or use the older controls in the Shot Editor to edit the in and out points. Figure 1. That’s a playlist on the bottom of the figure; note the useful trim controls on the bottom of the preview window on the upper left. For live shots in a playlist, right-click to set the duration of the shot. You can do this for VOD clips as well, though trimming in the preview window makes more sense. Beyond clip selection, you choose the transition to apply to the shots in the playlist via the button on the lower right of the playlist box. In Figure 1, the Cut transition is selected. You can also choose the shot Wirecast transitions to after the playlist finishes, or you can loop the playlist. This option is useful for after-hours operation. To queue and take the playlist live, use the normal program controls. During playback, a counter shows you how much time remains in the clip playing and the playlist as a whole. If you need to manually jump from clip to clip within the playlist while it’s playing, you can use arrow controls within the playlist. Overall, it’s a great addition that virtually all producers will use right away.